March is always tricky in terms of weather. How many times have I been delayed or stranded coming in or going out of Daytona, either driving or flying? More times than I care to remember. This year marked a first: I did not encounter any delays, and I arrived in Daytona midday to weather that felt…cold. Fortunately, the nice people over at Harley and Indian had both provided me with gear I would rely on more than I wanted to, thanks to the dipping temperatures. 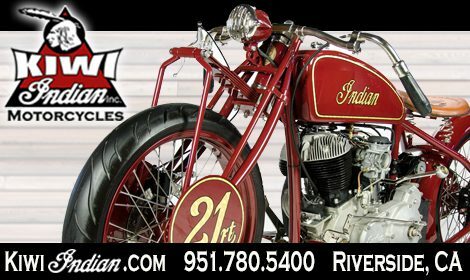 I rolled over to the Indian demo fleet where my contact, Steve, was gracious enough to let me store my roller bag and hop on an Indian Springfield Darkhorse. 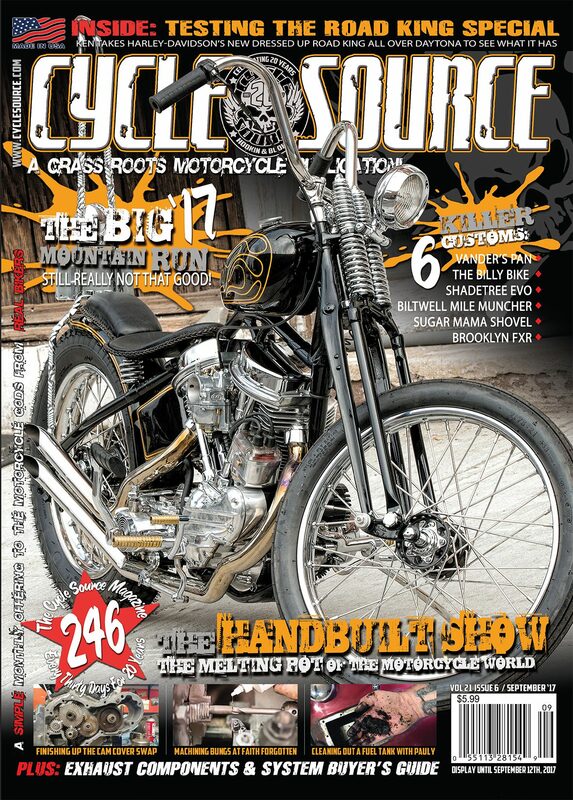 (I will have a full review of the bike in an upcoming issue.) As I drove off the lot onto the sandy streets of Daytona, the chilly air gave way to a sunlit warmth. I pointed the bike north, and the next thing I knew, I was at Hull’s Seafood on Granada, getting my fill of seafood and hushpuppies before I even unpacked my bag. If you’ve never been to Hull’s, be sure you address this oversight and indulge in their locally caught seafood and ridiculous hush puppies— it’s worth the indulgence. I’ve never been able to make every event during Daytona Bike Week, and this year, with all the bikes to test ride, I had even less time. One event I did participate in, though, was the Arai helmet launch. You can read about the specifics of the launch in my other article in this issue. For now, let me just say the coolest part of it was going to the short track and attempting some flat tracking. Once we wrapped that up, we headed north to St. Augustine via the loop. The riding immediately around Daytona is okay, but once you head north to Tomoka State Park and out to the coast, everything changes. Not just the scenery, but also the temperature. The loop is mostly shaded, and, as we made our way to the coast, the humidity and setting sun allowed for a brisk ride on the new Harley- Davidson Sport Glide. St. Augustine is worth the oneand- a-half-hour ride up the coast. Downtown is historic, with bricklined streets, great eateries and a very different vibe from Daytona. Our stay was short but well worth it. The next morning gave way to a beautiful sunrise as I scraped the ice off my seat. That’s right there was ice on my seat in Florida! I knew I wanted to get back to Daytona in time for Willie’s Tropical Tattoo ChopperTime Bike Show, but I wasn’t prepared for the icy air blast heading down the coast. I put on every scrap of top clothing I had, including a new Harley leather jacket and flannel—it kept my torso toasty warm, but my legs and hands began to stiffen. The cool morning breeze woke me up, but I had to stop to put on another pair of pants. Then I set the cruise control, fixed my gloved hands on top of the heads and made a speedy trip back to Daytona. I arrived at Willie’s and it was . . . Willie’s. If you’ve never been, a written description can hardly do it justice. I spoke to a builder who’d never attended, had never even heard of it, which baffled me. 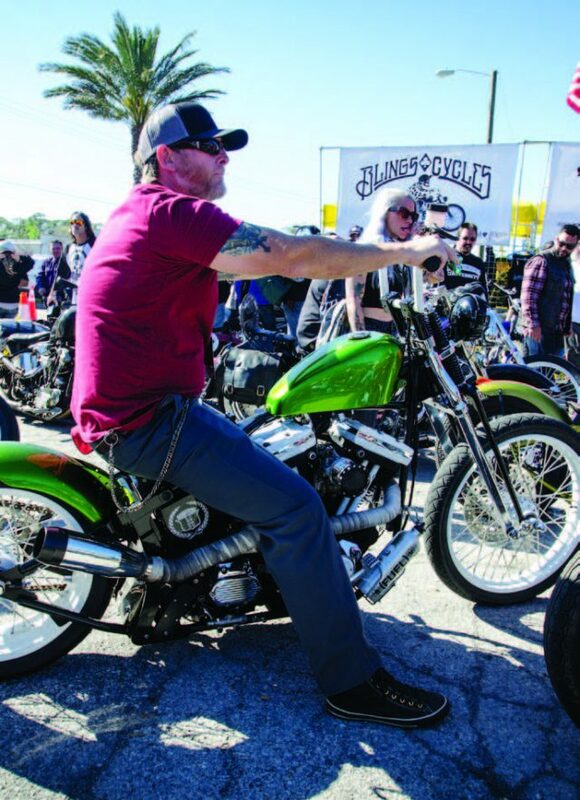 It is legitimately the largest bike show in Daytona, in the smallest location, all to benefit veterans. There are so many cool bikes, and it’s hard to take it all in. 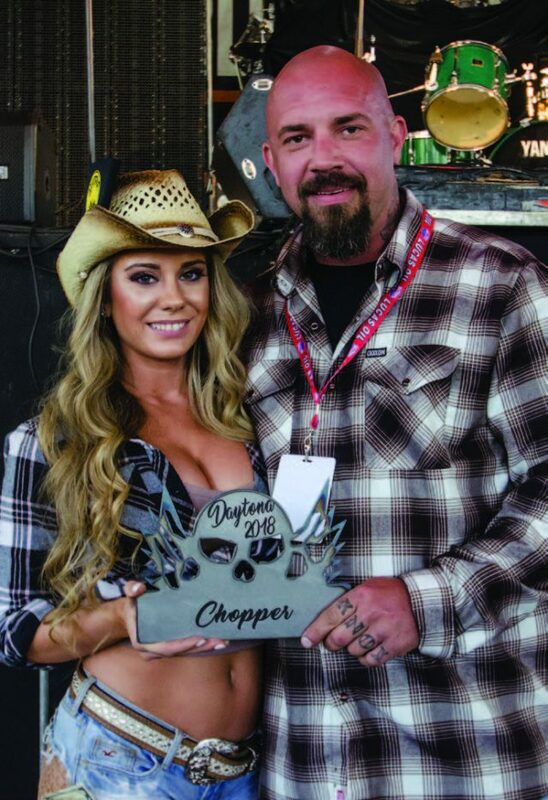 You also encounter so many old friends, great music, giveaways and coveted ChopperTime trophies. 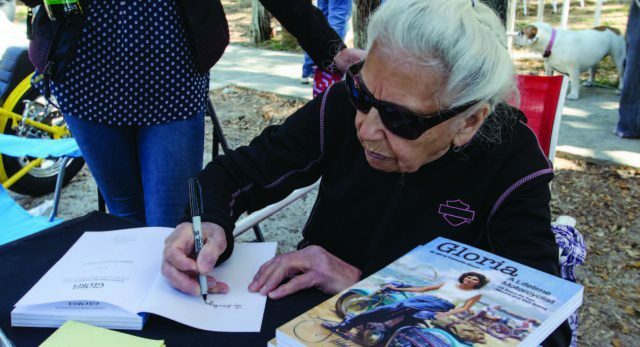 This year, Cycle Source’s own Heather Callen stepped in and handled registration, and, at last count, there were more than 140 bikes. Roadside Marty served as master of ceremonies, and Chris Callen and I even got to do a live Shop Talk inside the tattoo studio. It was a great day that ended with me blasting down Beach Street as the sun set in the west, on my way to the TT Flat Track race. If you’ve never been to a flat track race, I recommend hitting a TT and paying the extra money to be on the infield. TT races are good because they offer a bit more action, with both right- and left-hand turns, and there are also steeplechase-style jumps in the middle of the course. I love the Daytona TT because it is one of the first races of the season, so you know everyone is all pent up, and they’ve been thinking all winter about how they can be faster. This leads to aggressive riding and really fun races to watch. I got to spectate from the Arai box this year, which was nice, considering the 40-degree temps. I never want to see anyone crash, but the crowning crash this year was a Harley that broke its swing-arm in half, off the jump, in the middle of the race, and the rider landed the jump. The twin class was fraught with crashes and restarts, but, ultimately, reigning champion and Indian Factory Rider Jared Mees came out on top. The singles class had Dan Bromley on a KTM as the winner. Main Street was hopping that night, with the weekend crowds starting to pour in to celebrate the beginning of riding season.Friday gave me the opportunity to head to Annie Oakley’s, out by the Interstate, and celebrate custom chopper culture at the Boogie East, put on by Chemical Candy Customs, Gasshole and VNM. This is the second year for this event, and it seemed bigger than ever. 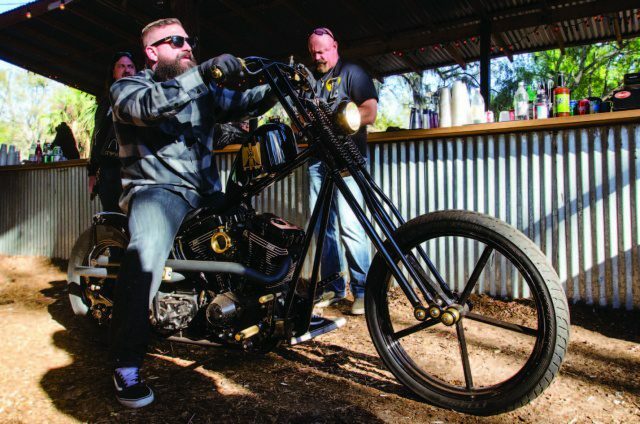 The intention goes beyond recreating a backyard biker bash of yesteryear—it serves to honor a friend and mentor to Scott at Chemical Candy Customs. In the early 90s, in East Texas, Scott worked for Pete LaBarbera bricking homes. 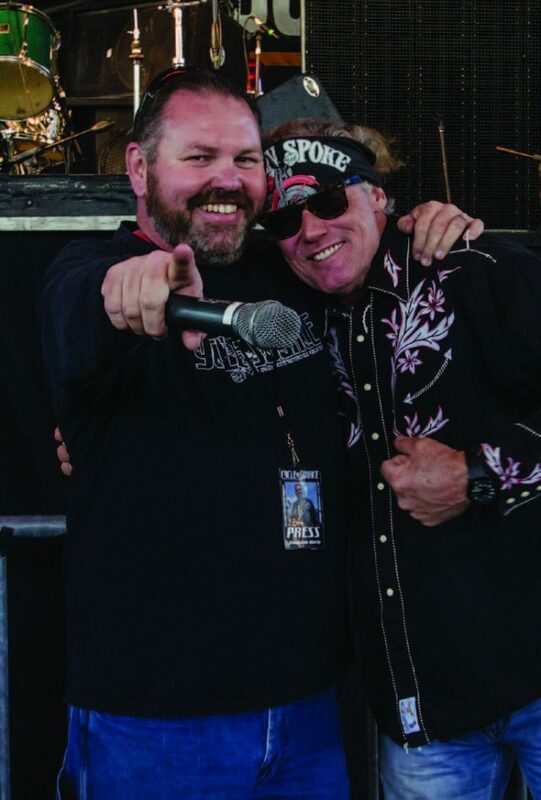 On the weekends, Pete would throw some wild biker parties and introduced Scott to Daytona Bike Week. One day Pete announced that he’d sold the business and bought a biker bar in Daytona. Scott always had the intention of heading to Daytona and visiting Pete, but he never made the trip. Then he learned that Pete had passed away. 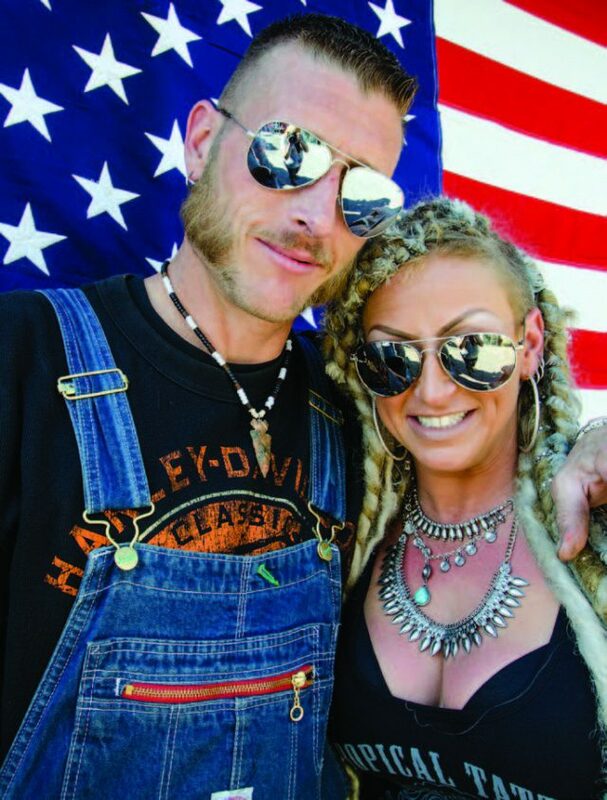 When he finally did make it to Annie Oakley’s, he decided it was the perfect spot for a backyard biker bash, Daytonastyle, in memory of Pete LaBarbera. 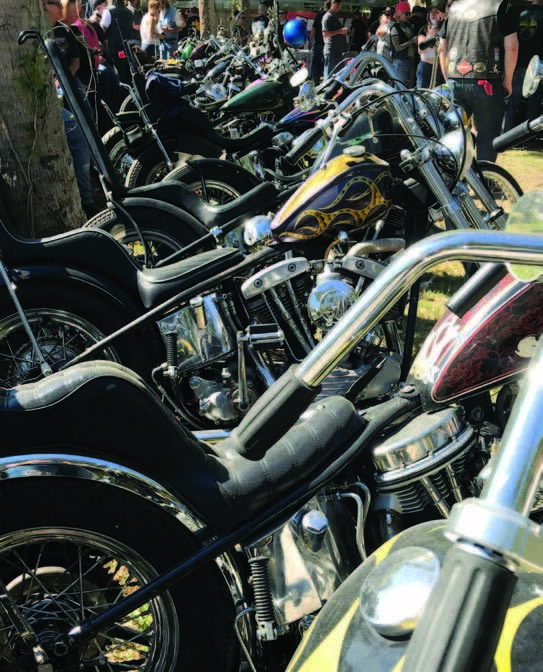 To keep the old-school tradition alive, the bike show is open to pre-1984 bikes and featured many makes and styles, all in the tree-lined comfort of Annie Oakley’s, while Lulu Van Tuckett and The Outbound Train brought the entertainment. The party went well into the evening as many got into the St. Patrick’s Day spirit. Indian Motorcycle was gracious enough to extend my demo of an Indian Chieftain Darkhorse (reviewed soon) so I could attend the Sons of Speed race out at New Smyrna Speedway. This year saw additional classes and numerous new riders. It is hard to explain the feeling one gets seeing 100-year-old motorcycles thundering past in a pack at over 80 mph—it never ceases to amaze me. The 45” class made the race accessible to more people, thanks to 45s being more affordable and easier to find than boardtrack-era racers as well as simpler to ride. With additional practice open prior to race day, we found out our pal Josh Owens, of the show Moonshiners, suffered a nasty spill that put him in the hospital with broken ribs, a tornup hand and a broken nose. Rumor has it that all he wants to do is heal up and get ready for the next Sons of Speed in Sturgis. That crash during practice runs didn’t take any speed off the racers, though. They battled it out in every heat and every class. The finals were blisteringly fast in the Hot 61” class. Matt Walksler (Harley) walked away with the Bill McCann custom trophy, and eBay Jake (Harley) found second place, with Brittney Olsen (Harley) finishing third. 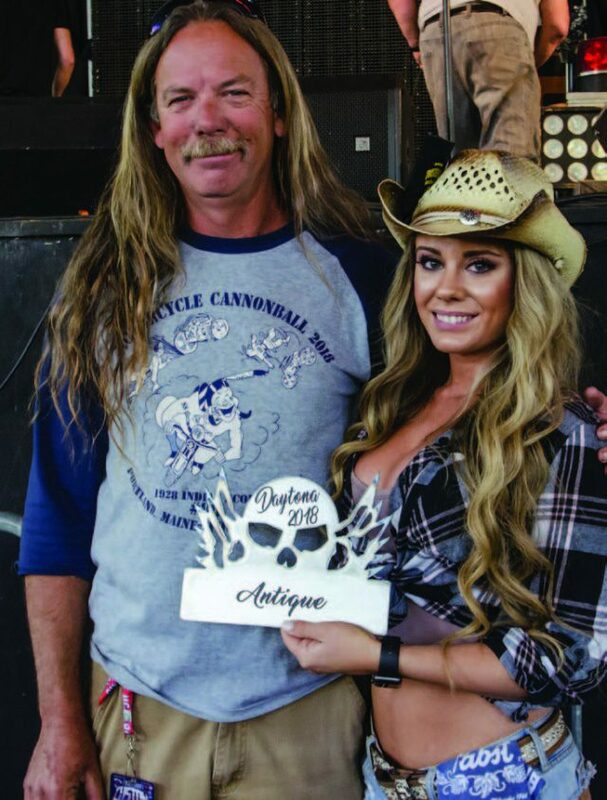 The 45 Shootout saw Doug Young (Harley) winning out over Brittney Olsen (Indian) in second place and Go Takamine (Indian) in third. The early 61” boardtrack bikes that hadn’t been hopped up featured Ken Curtis (Harley) in first, Shelly Rossmeyer-Pepe (Harley) in second and Rick Petko (Indian) in third. 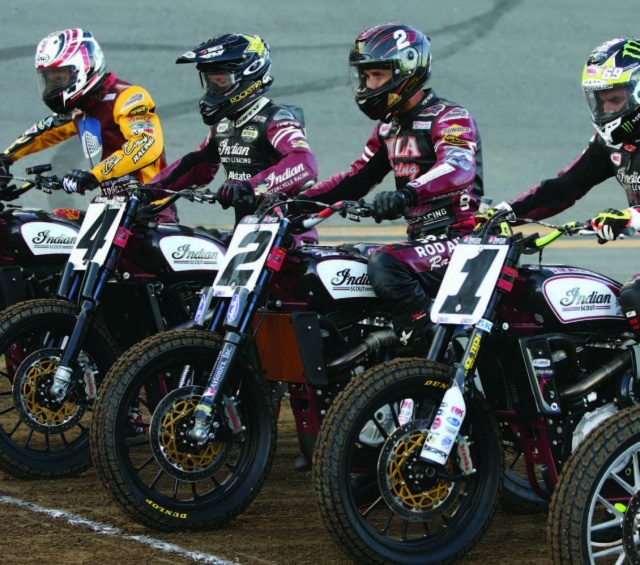 You can be sure many of these racers will be in Sturgis at the Full Throttle Saloon, discovering what they can do with these bikes on a banked dirt track. As Daytona came to a close, it seemed obvious to me that the custom world of motorcycles is thriving—maybe not in numbers, but in passion. 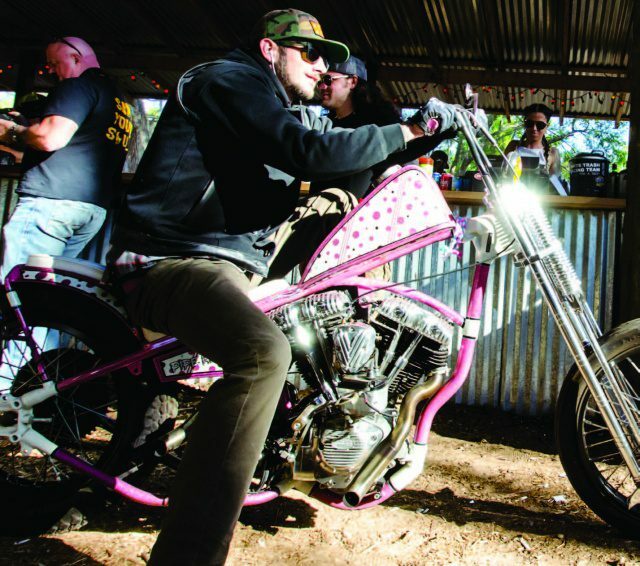 There were more custom bikes than ever wherever you looked and riders who lived the culture through and through. The weedingout process has begun, and you can bet that next year the bikes will be even better in Daytona. 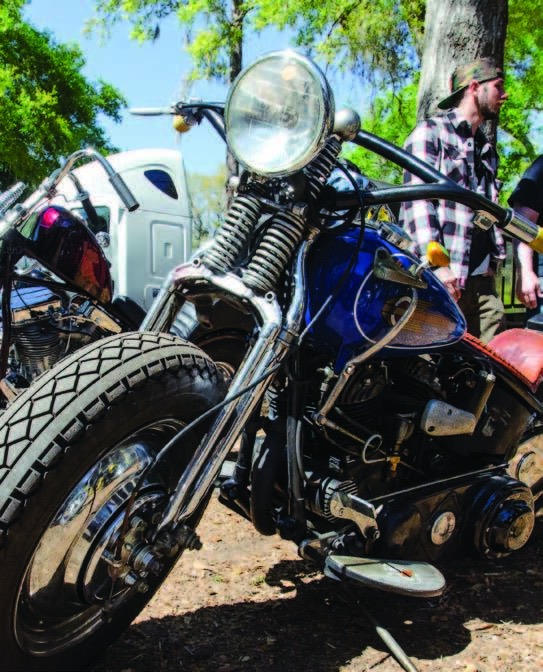 This entry was posted in Event Reports, Rallies and tagged Back Issue, Cycle Source, Cycle Source Bike Show, Cycle Source Magazine, Daytona, Daytona Bike Week, Events, June 2018, Rallies, Sons Of Speed. Bookmark the permalink.